This isn't your regular hot cocoa folks. 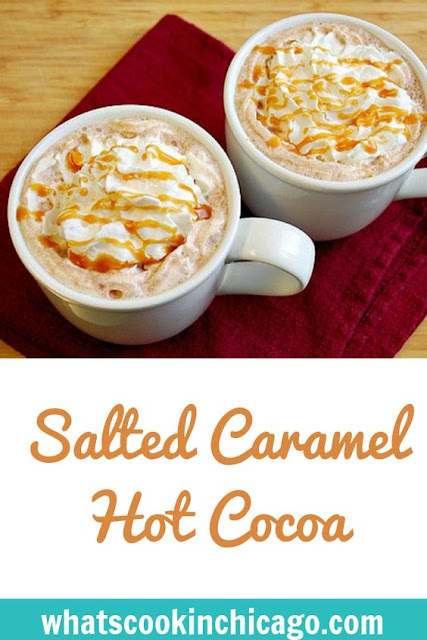 This is a salted caramel hot cocoa. That means a lot of sweet love is going into each mug so it's something to savor and sip. And with each sip, you'll get a perfectly balanced taste of buttery caramel with a hint of salt and rich chocolate topped with fluffy whipped cream. Each mug of this decadent hot cocoa is coated in a caramel sauce. Next, Dutch processed cocoa and sugar are dissolved in a little warm milk to create a little paste. This sweet chocolate 'paste' makes it easier to incorporate the warmed milk that will turn itself in the hot cocoa you've been waiting for. 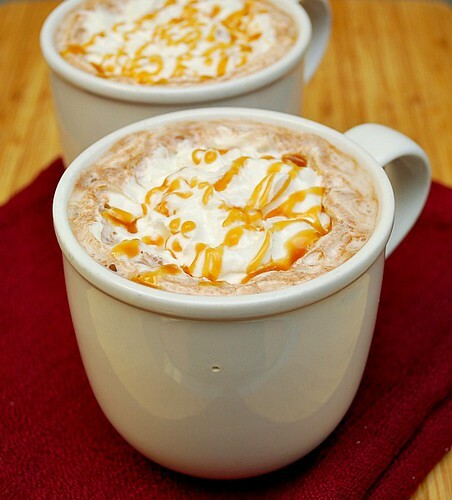 As the warmed milk incorporates with the sweet chocolate paste, the caramel coated sides of the mug begin to melt and give off the buttery caramel flavor. That is what makes this cocoa so balanced. So skip the trip to the local café and make this at home. I'm already on my 2nd mug and you've got to catch up with me! Heat milk in the microwave or in a small saucepan until warmed but not boiling. 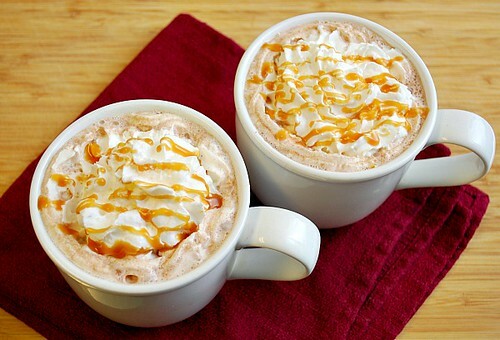 Meanwhile, pour 2 tablespoons of caramel syrup into a mug so the inside of the mug is coated well. Add Dutch cocoa, sugar and 2 tablespoons of warmed milk to the bottom of the mug and stir to dissolve completely. Pour in the warmed milk into the mug and stir to combine. Garnish with whipped cream and drizzle with remaining 1 tablespoon caramel. Sprinkle sea salt over the top and serve. Oh my gosh, this sounds ridiculously good. I can't get enough of salted caramel and I love the technique of spreading the caramel around in the mug so it distributes evenly. This sounds fabulous! Love the technique too! I've had this hot cocoa from the Ghirardelli shop here in town - love it! Kept us warm on a chilly day of window shopping. I bet this is awesome! I have had salted caramel chocolate mousse before and I am dreaming of this being the liquid form. Yum! Ahhh, and I was with you when we had this awesome cup of yumminess!! Thanks for reminding me to make a cup of it at home!! Mmmmm, fantastic!!! Wow! It sounds so delicious! Hmm . . .Suddenly I'm feeling rather cold, with big craving for some warm beverage. I wonder why? Thanks so much for posting this. You have saved my addition for the salted caramel frappacinos from Starbucks. I have gotten hooked on the flavors of salt, caramel and chocolate. And to make it even better, the weather here has finally gotten a little chilly. This looks delicious and comforting, I've been so amazed with salted anything ever since that episode from Modern Family and adding some salt to chocolate milk. Great photos! So decadent yet so simple to make! Savorique - I'm definitely going to try that adult version soon... yum!! Oh that looks so delish! I would love to have that for New Year's Eve!